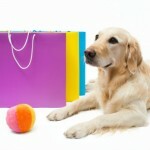 One of our readers suggested Muffin’s Halo as a product that might be helpful for blind dogs. I wish this product was available when we still had our Sadie. We nicknamed her “pinball pup” because she was constantly bumping off the walls as she navigated her way through the house. Fortunately, she was never hurt, but we were constantly worried about her, especially when out in the backyard where there were plenty of dangers, such as bushes and vines. 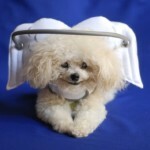 Muffin’s Halo is a device consisting of a harness that wraps around the neck and torso of your dog. Connected to the harness are “wings” which hold the “halo” that sits several inches in front of your dog’s face. When they run into something, the halo signals them that they can’t continue in that direction. Muffin’s Halo is adjustable (with velcro straps) and washable. It has received 4 out of 5 stars on Amazon. Check it out. 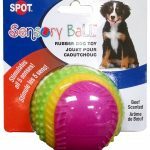 We hope it helps your dog navigate safely through his or her environment.